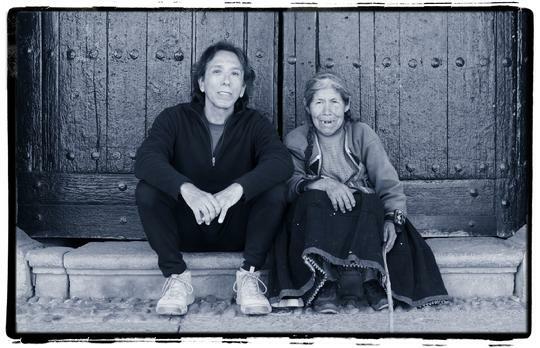 Juan Alejandro Ramírez and Tomasa Chimpu in Chinchero, Peru while shooting "Y Seámoslo Siempre" (provisional title) Film photographed on location in parts of the Chinchero Plateau, in and around the towns of Cruzpata, Pongobamba, Huatata, Huayna Qolqa, Raqchi, Piuray, and others. It has an anticipated release date for the last quarter of 2018.
indieWIRE's Howard Feinstein on Ten Films to Watch . 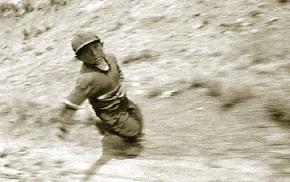 . .
Peruvian national Juan Alejandro Ramirez, . . . is probably the only filmmaker whose work-in-progress I would include on this list. He is, to put it mildly, special. No sellout, he. His films (Porter, Diary of the End) are never longer than one-half hour and have a commercial potential of zero. 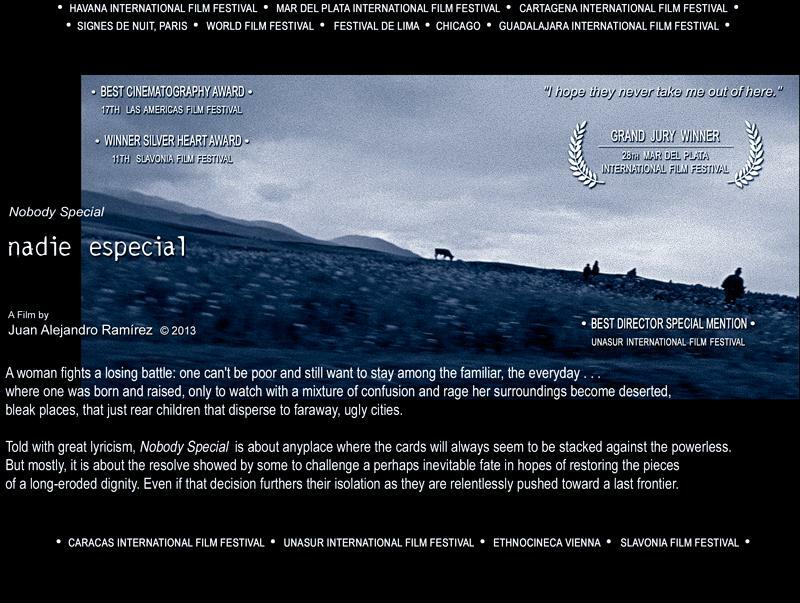 His trademark style includes a lyrical mix of fiction and documentary (they look like docs, but the scenes are often re-stagings of real, or at least possible, events and actions), wide-angle and close-in shots, haunting voiceover, and a sincere empathy for the underclasses in Peru. 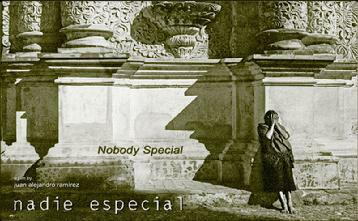 Nobody Special centers on three Peruvian women from three eras, all of whom lead difficult lives, but there is diversity, therefore grace, in their differences. "Las (obras) que comprenden Perú: Radiografía Fílmica de un País son películas que no se han ido, sino que se nos acercan cada vez más. 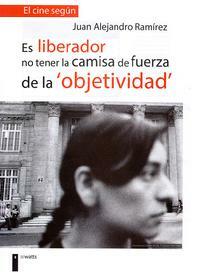 Hermoso es comprobar que, con el pasar el tiempo, se han revelado como piezas representativas de su época, cual vestigio de su histórica vigencia, y han ido construyendo una memoria que se solidifica manteniendo incandescente el recuerdo de lo que alguna vez fuimos. E, incisivamente, bosqueja cómo somos ahora." 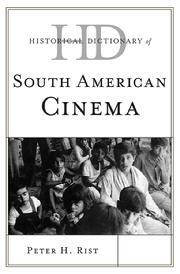 To read a condensed summary of both film work and biographical information about Juan Alejandro Ramírez as it appears in the entry of the HISTORICAL DICTIONARY OF SOUTH AMERICAN CINEMA (Rowman & Littlefield), please click over the picture on the right. "Antropólogo y cineasta peruano radicado en Nueva York. Su forma de hacer cine es bastante peculiar: el mismo produce, filma, edita, narra y musicaliza sus películas. Creador solitario, pone especial énfasis en las imágenes que captura en 16mm sin sonido directo. 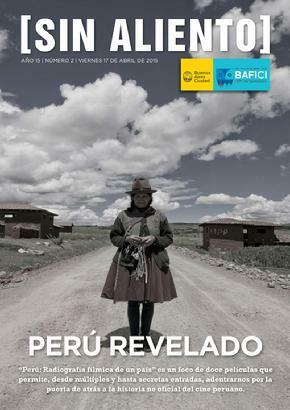 Sus películas han recorrido los mas importantes festivales de cine documental del mundo, varias de ellas han podido verse durante el Festival EDOC. EI cineasta «hombre orquesta» reflexiona sobre como lIegó a hacer el cine que hace, cuales son sus inspiraciones artísticas y sobre la objetividad en el arte." Juan Alejandro Ramirez was recently Guest Lecturer at the European Film College in Ebeltoft, Denmark. He presented a selection of his filmography and discussed his work method with the 2009-2010 Class of the prestigious Pan-European institution. 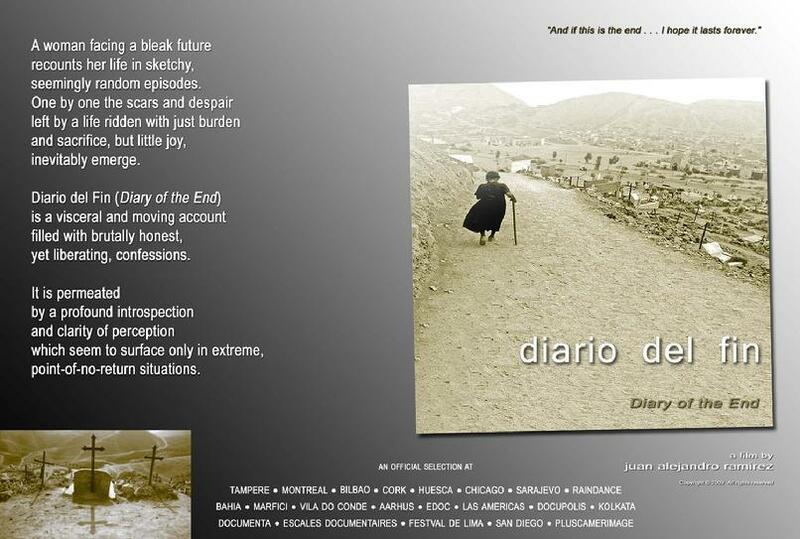 Faraway from Here (Muy Lejos de Aqui), Porter (Solo un Cargador) and Diary of the End (Diario del Fin) were screened as a means to illustrating challenges and resolutions to different situations filmmakers face in the production of author-driven Non-Fiction work. • Click on the EFC icon to view some photographs taken during the event. 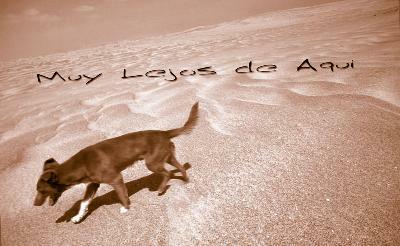 "Alguna Tristeza is poetry -- oral as well as visual. This is what filmmaking is all about. How do you package a message without sacrificing images and metaphors?" 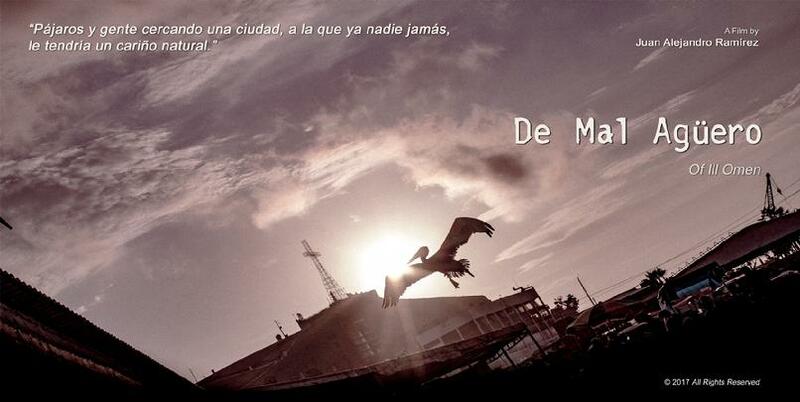 "Juan Alejandro Ramirez is one of the most poetic documentarians working today." A group of seemingly unrelated vignettes emerge as both personal and distant, but always intensely emotional in tone . . . ultimately, shaping up as a sketch-book on some features that seem to mark the lives of those who grow up poor in poor countries. This personal narrative offers neither formulas nor solutions: rather, it is a random pursuit for answers that unravels into a series of powerful, lyrical epiphanies. A sharp eye for detail and a stirring poetic narration turn the images of this film into a moving metaphor for all kinds of inequities. "A darker, more troubling, but no less transcendent philosophical exercise . 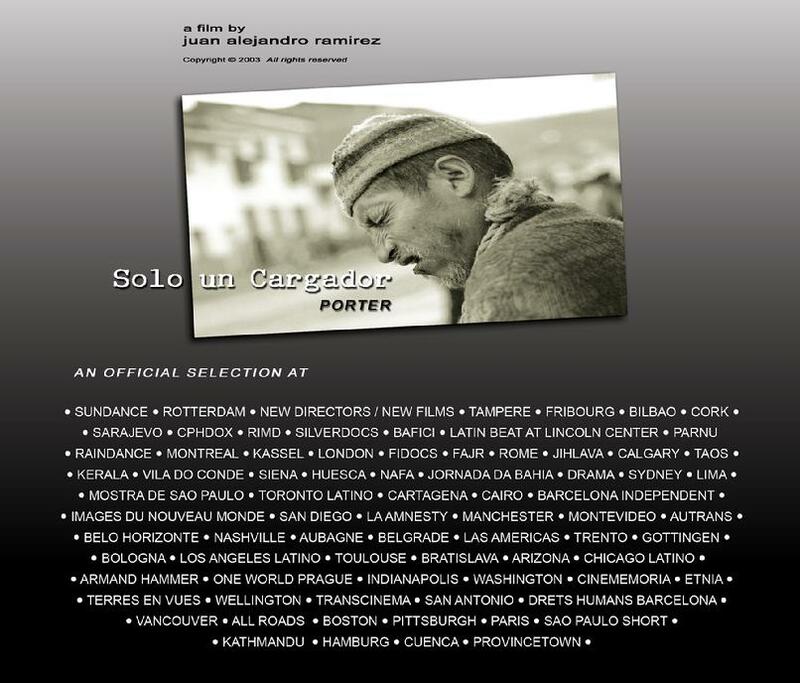 . . Porter, by Juan Alejandro Ramirez, is about one fictionalized cargador, brought to life in an uncannily penetrating first-person voiceover constructed by Ramirez from various accounts by these peasant laborers. In this intensely subjective, stream-of-consciousness monologue . 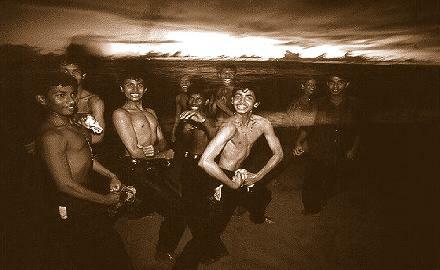 . . (a porter) shares his often astonishingly acute thoughts about his low place in the world, his hopes and failings, and his invisibility to the gringos who are so dependent on him, however briefly. This is not a sentimental, self-satisfied story celebrating a group of unfortunates. Ramirez does something very different by having the porter, the Other, seemingly take control of the storytelling and the images, making him a true subject, and not the object of either scorn or pity. The effect of hearing this voice is devastating, pointing out as he does the chasms in understanding between people." "A beautiful portrait, meticulously filmed . . . a film with a human face." " . 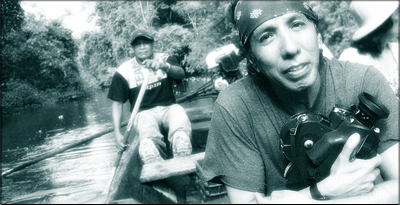 . . Ramírez has built a work of art in this poetic journey of his concept of a self-loathing porter." results in a work of devastating beauty." " . . . this film succeeds in permeating the audience with a feeling of longing for the past that all men - whether fortunate or not - radiate when far and away from their origins."
. MONTREAL . LA HABANA . BERLIN . BAHIA . TOULOUSE . NEFF . MONTEVIDEO . CAMBRIDGE . CHICAGO .